Presale tickets include gate admission (regularly $8). If you purchase day of show, you'll have to pay the $8 Fair Admission at the gate, then pay for concert tickets at the box office ($8 at gate + $20 at box office = $28 for GA; $8 at gate + $30 at box office = $38 for VIP track seating). The box office will open at 5:00pm. IMPORTANT: Presale ticket holders MUST use the Bagley Rd Gate 5 Entrance. This year, Wish You Were Here will be performing Pink Floyd’s greatest hits, classics and obscurities. The band will perform 2 sets, separated by a 15 minute intermission. Wish You Were Here’s theatrical concert presentation combines Sight and Sound to capture the mood, emotions, and intensity of the Pink Floyd experience. The show utilizes a veteran 9-piece musical ensemble featuring 6 vocalists, including 2 female vocalists, and a Floydian stage production - sound effects, videos on a large circle screen, Wall set pieces, flying inflatables, and a choreographed light show with rolling fog, moving lasers and state-of-the-art intelligent lighting - all produced by experienced industry professionals with a fan's obsession for detail. The band authentically recreates the music from Pink Floyd's entire career, performing the crowd favorites that all rock fans recognize, interspersed with the show-stoppers that appease even the most ardent Floyd fanatics. Formed in 1987 under the moniker of “Harvest Pink Floyd Revue” as one of the first bands in America to tribute Pink Floyd, and revised in 1995 as Wish You Were Here, the band is one of the longest continually-performing Pink Floyd tribute acts in the world. Its core members have been at the forefront of the tribute band movement for 30 years, with an unparalleled history of record-breaking concerts and celebrated theatrical productions thoughout Ohio and the Midwest, as the band enters its 22nd year. 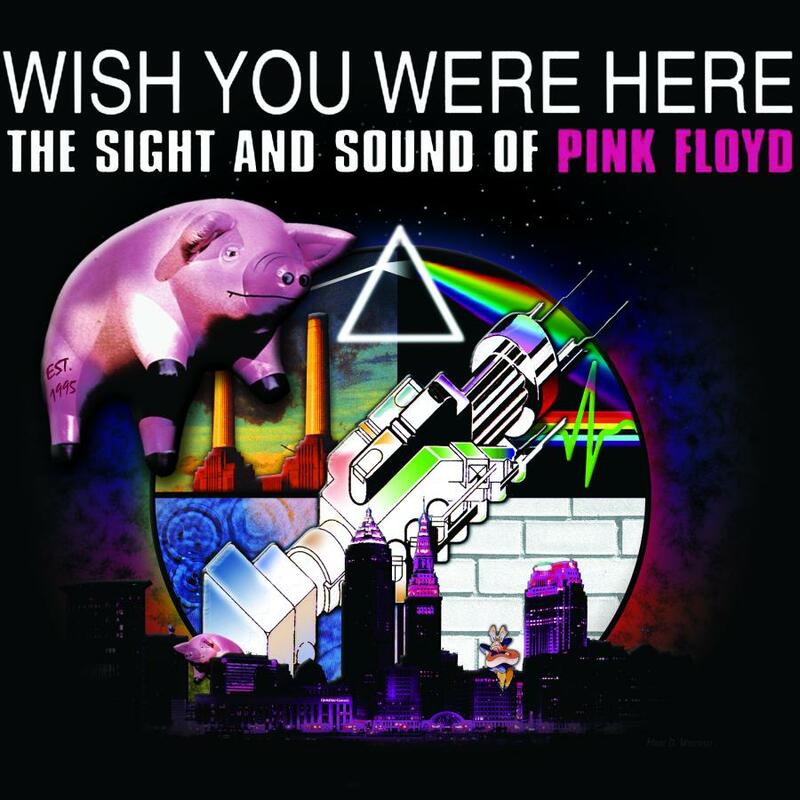 Wish You Were Here has gained international recognition, in books such as The Rough Guide To Pink Floyd, for it’s detailed recreations of Pink Floyd’s greatest albums and tours, performing the 1973 Dark Side Of The Moon show on the very same stage at Blossom Music Center in 2006, the 1972 tour show at Akron Civic Theatre also on the same stage, and the 1977 Animals tour show at the Nautica Pavilion in Cleveland in July 2005. In 2008 the band staged the most elaborate production of The Wall ever performed by an American Pink Floyd tribute act, at TimeWarner Cable Amphitheater and theaters in Ohio.